Mr. Underdown has experience in the area of annuities as a marketer of structured settlements. As a result of that experience, Mr. Underdown has seen a wide variety of uses for this product. You may view his article on Structured Settlements in Publications. Additionally, Mr. Underdown has consulted with clients and provided them with annuities, and the security that an annuity promises. As a claims professional, Mr. Underdown has experience as a multi-line adjuster. He handled many liability claims that arose under Comprehensive General Liability policies. In addition, as a Risk Manager, Mr. Underdown was responsible for developing the specifications for and purchasing General Liability policies for employers in various industries. As a Risk Manager, Mr. Underdown was responsible for developing the specifications for and the purchasing of Directors & Officers (D&O) policies for employers in various industries. As a result, he understands the intricacies of the D&O policy form. Additionally, Mr. Underdown has experience in the supervision of large Directors & Officers liability claims. As a result of his employment as a Risk Manager, Mr. Underdown has experience working with the development and application of Experience Modification Factors (emod). He maintains that a look at the emod for a specific company gives a good insight into the management of the company. Since emods are developed for specific industry codes, an emod of over 1.0 indicates the management of that particular company is doing worse that the industry average. Mr. Underdown published an article on how to tell the health of a company by use of the emod, titled Business Valuation Guide for Mergers and Acquisitions: A Simple Insurance Question which can be found in Publications. Mr. Underdown has experience in the area of fidelity bonds both as a Claims Adjuster and as a Corporate Risk Manager. As a Claims Adjuster, he handled fidelity bond claims. As a Risk Manager, Mr. Underdown was responsible for purchasing fidelity bonds for his corporate employers. As an Expert Witness, he handled a large defalcation from a financial institution and is therefore experienced with financial institution fidelity claims. As a Claims Manager, Mr. Underdown was called upon to interpret policy language based on the insurance company guidelines. 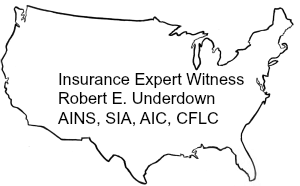 As an Expert Witness for insurance companies, Mr. Underdown provides expert analysis and testimony on a wide range of issues. As a Risk Manager, Mr. Underdown has developed an ability to write specifications for insurance coverage and follow up to ensure that all specifications were complied with. A part of policy selection is to know the corporate appetite for risk. That is, how much risk is the corporation willing to accept in exchange for a reduction in insurance costs. As a Claims Adjuster, Mr. Underdown worked on a number of professional liability claims, usually doing field work such as taking statements from doctors and other witnesses. As a Risk Manager, he was responsible for the oversight of professional liability claims for city firefighters and police. Additionally, he was responsible for handling many professional liability claims of paramedics, including fatalities in some very severe injury cases. Mr. Underdown has experience in the area of property and casualty coverage as a Claims Adjuster, Claims Supervisor, Claims Manager and Risk Manager. As a claims professional, Mr. Underdown adjusted and managed a wide variety of claims including: property losses, such as windstorm and fire damage to residential and commercial buildings; and personal property losses, such as burglary and theft. In the area of casualty coverage, Mr. Underdown has experience in, but is not limited to, the following areas: personal and commercial vehicle liability claims, personal and commercial general liability claims, directors & officers liability claims, and paramedic medical malpractice claims. As a Risk Manager, Mr. Underdown has experience dealing with retrospectively rated plans in the areas of workers’ compensation and general liability. He is able to review the policy wording and calculate the retrospectively rated premium. He is also very familiar with the security requirements of retrospectively rated plans. Mr. Underdown has experience with surety coverage from the view of a public entity that required surety in the form of bid bonds and performance bonds for public works projects. In addition, he also has experience from the view of an entity that was bidding on numerous contracts that required performance bonds and the various security methods to secure the bonds. As a Risk Manager, Mr. Underdown has experience in the selection and placement of umbrella insurance policies up to $100 million in limits. It is his opinion that one of the most important parts of a well designed insurance plan is the foundational or primary limits over which the umbrella policies are placed, as that sets the underlying coverage. Mr. Underdown has experience with vehicle fleet insurance as the Risk Manager of a corporation that had twenty large semi-trucks making urban deliveries seven days per week. He was also the Risk Manager for the fifth largest city, with a fleet of hundreds of vehicles including police, fire, trash, and buses. Additionally, Mr. Underdown was the Risk Manager responsible for a fleet of over 2,500 emergency vehicles nationwide. Mr. Underdown has experience with workers’ compensation in a variety of industries, including retail stores, financial institutions, ambulance and public entities, including police, fire and public works employees. The area of public employees presents some unique challenges because of the typical statutory requirement for full salary replacement for injured workers. In addition, there is the difficulty of managing workers’ compensation claims for public safety employees with the possibility of disability retirements with full pay. In the ambulance industry, Mr. Underdown’s experience includes dealing with workers’ compensation premiums in some states as high as 25-50 percent of payroll.